A Beautiful Ruckus: Calling All Prayer Warriors! We Need Your Help! Calling All Prayer Warriors! We Need Your Help! We are foregoing our normal Little Things Thursday post tonight, because I have something far more important and urgent to write about. Let me start by saying, we aren't pregnant. This is actually an ultrasound photo of our soon-to-be-born niece! My brother and sister-in-law, Mike and Sarah, are eagerly awaiting the birth of their second daughter, Aubree Grace. Isn't that beautiful? She has an older sister, Alyvia, who is almost 2. So fun! I love that my kids have cousins so close to their age! Sarah is due in October, and is currently 17 weeks along with little Aubree. Last week, she went in for a routine checkup, and the doctor found an abnormal heartbeat. An ultrasound the next day, followed by a specialist visit the day after that revealed that Aubree has some severe heart defects. All of Aubree's internal organs are reversed. Her heart and stomach are on the right side of her body instead of on the left side, etc. This, in and of itself, is not too scary. As long as the doctors know which side her organs are on, they can compensate for that. One of the bottom chambers of her heart stopped developing at 8 weeks. However, the doctors aren't sure if it's the lower right or lower left chamber since her insides are all backwards. The heart is definitely on the wrong side of her body, but they aren't sure if the heart itself is also reversed. Regardless, it's a problem because it's the part of the heart that pumps blood back out into the body. To fix it, Aubree will need three open heart surgeries before she reaches age 5, all of them requiring long hospital stays. The first one will be immediately after delivery. Aubree has a complete heart block. The part of the heart that acts as a "pacemaker" is malfunctioning, most likely due to the underdeveloped chamber. While the top two chambers are pumping at 130 beats per minute, the bottom two chambers are only pumping at 90 beats per minute. The chances of fatal heart failure while in the womb is 50%, with the odds not improving much in the first few hours after birth. The pediatric specialist that they are working with has seen each of these issues separately, but not all together in the same baby. Her issues are extremely rare. The odds of one baby having all three defects is 1:1,000,000,000,000. Obviously, Aubree is a very, very special baby! When I was pregnant, our family and friends came around us and prayed for our babies all of the way through. In fact, we even had prayer teams for each baby. I know we still have prayer warriors reading our blog. There are probably quite a few from our pregnancy days, and I know there are a lot of new ones as well. God is so much bigger than all of the statistics and medical advice that is out there. Our family is proof of that. As I hold my kids a little closer, knowing that none of this is beyond God, I'm begging prayers for my sweet little niece, Aubree. 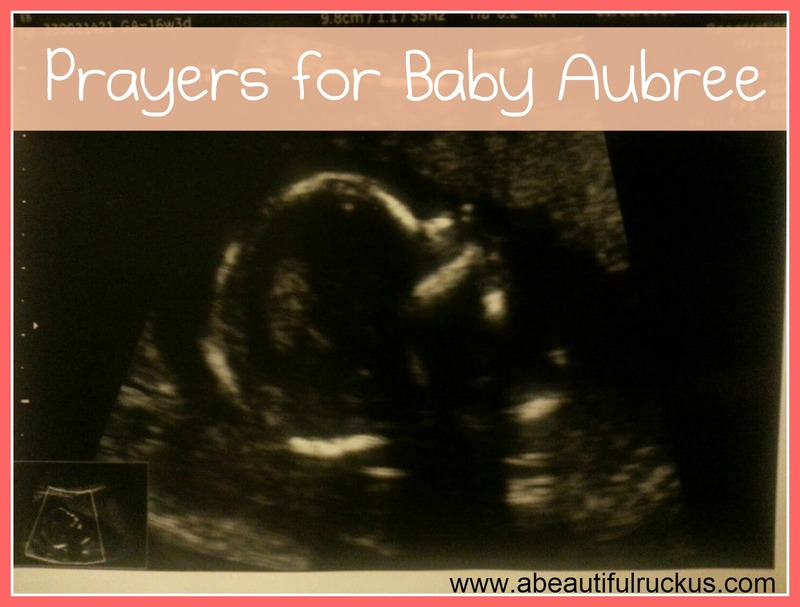 Please pray that God allows Aubree to live through the pregnancy and coming surgeries. Please pray for her parents, Mike and Sarah, who are walking through such a difficult, unknowing time. Pray their marriage stays strong, their faith only increases, and for specific protection for Sarah as she moves through this high-risk pregnancy. And please pray for their extended family as we try to support them, but not overwhelm them, in the days to come. Our baby prayer teams from when we were pregnant were such a source of strength to us. We would often read through the people praying for our babies and know that they were covered in prayer. If you are willing to help by praying for Mike, Sarah, big sister Alyvia, and baby Aubree, would you be so kind as to leave a comment saying that you will, along with what state or country you are in? I would like to print out the comments on this post and give it to them as something they can hold on to. And if you want to share this post with your church prayer chain or FB friends, we would be very grateful for any extra prayers that you can send their way. You all have walked through so much with us over the last few years, and I'm thanking you from the bottom of my heart for continuing to walk with us and our extended family. Thank you! So many prayers for sweet Aubree! Please keep us posted and know that we are all thinking about you and your family! Praying for Aubree, her doctors and perhaps future sugeon. Praying so hard in Las Cruces for precious Aubree, her parents, and sister. I can only imagine how The Lord is going to use this sweet miracle girl for His glory! As I hold my precious gifts tonight(one of which, is also Aubree! ), I will lift up your family and pray The Lords healing touch on Aubree Grace, believing that she can be healed in His Name! Praying for Aubree and her family for God to give them strength. I had prayer warriors that pulled my little Emma through. I will definitely pray for Aubree. We are praying. We have triplets and one of them was given a slim chance of survival. Not only did she survive, but she is perfect! So we know the power of prayer and what it can do. We will pray and pray for this sweet girl. Praying down here in Australia for Sarah and Aubree and the rest of the family! That they would know God's power and strength through all this! Yes, add me to the list. Praying for the whole family! We are praying for Aubree. We pray that Lord will lay a healing hand upon her. We pray for grace and peace for Aubree's parents. We pray for joy. We've been praying and will continue to do so. Praying for Aubree and the rest of the family! Also, this is the second time I have ever heard of a person's organs being reversed. My cousin's organs are that way. That, in itself, doesn't seem to be much of a problem for her. It's those other things Aubree is facing that I'll especially be praying about! The Lord be with you all!! Praying for Aubree Grace here in Grandview, Missouri. The Lord is able to do exceedingly, abundantly above all that we can ask or think. He is knitting Aubree together in her mother's womb and He is able to heal her completely. Praying for protection, strength, wisdom, grace, and peace. Some friends of mine just had a baby who doctors said might never see, laugh, walk, or reach many other normal developmental milestones. In just his few short months of life to this point, he can clearly see and he is one of the most joyful (laughing) babies ever! Their doctors told them that when damage happens so early, it is possible for it to be reversed because the baby is still developing. I pray that similar and even greater miracles would amaze and astound Aubree's doctors and others, that the power of Jesus may be made evident to many. Blessings! I will be praying for God's healing on this little body he created. From Nixa, MO. Yes, I am praying for Aubree, and your brother and sister-in-law, and big sister Alyvia. Psalm 139, 13-14: For you created my inmost being; you knit me together in my mother’s womb. I praise you because I am fearfully and wonderfully made; your works are wonderful, I know that full well. You've got it. What a beautiful famaily <3 From SC! Many prayers for Aubree Grace from Gurnee, Illinois. 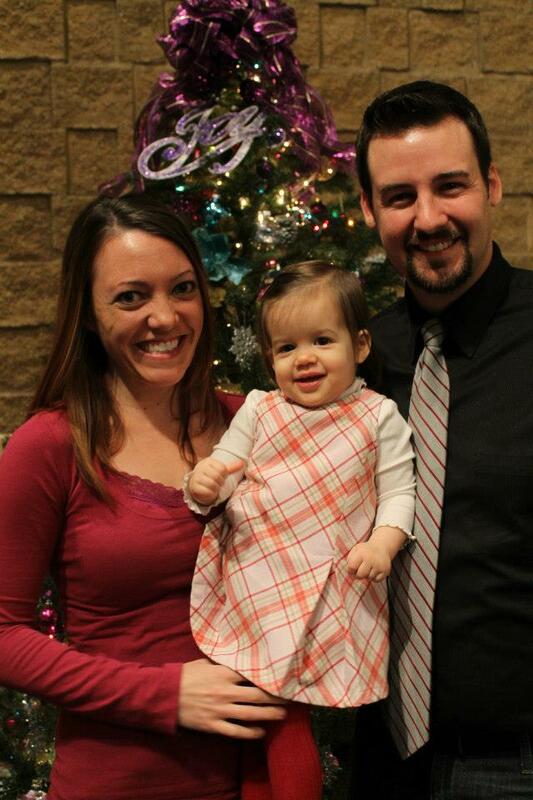 Praying for baby Aubree and her family in Lee's Summit, MO. Rebecca- I agree with you 100% about the prayer warriors! We had them praying for us during my pregnancy with the quads too. Aubree Grace, we are praying for you in Fort Worth, TX! You are a special baby indeed. Praying for little Aubree Grace and your whole family. Praying for Aubree. Praying for Mike, Sarah, and Aly. Honored to be praying for these friends of ours. ~Craig, Leesha and Jace from Mayview, MO. While reading the post, the presence of God was so powerful where I was sitting. God is definitely at work in little Aubree's life. I will be praying for complete healing, because nothing is impossible with God. With tears welling, I pray for the family and for the doctors! Prayers are powerful and your have prayer warriors here! Praying for sweet Aubree and her parents in Mesquite, TX! I will be praying for Aubree and her parents. May God put His healing touch on her while she is still in the womb! Lifting you up in Alaska! Gus and I will lift this precious family up, for sure. Thank you for sharing. Def. thinking of them and praying! I will pray for your family! God is with you and your family and he will heal! I like this verse and feel it may help! Our prayers are with them. I will also share on my FB page. Overland Park, KS. Praying for baby Aubree and family. Our God has the power to heal! I pray that he protects and heals little Aubree and gives strength and comfort to Mike and Sarah. Of course, Rebecca...pls. know we will be praying and we will share it with our church family on Sunday. Big hugs to Michael and Sarah! Praying for Aubree and her family in Ohio! Philipians 4:13 "I can do all things through Christ which strenghtens me." Dear Lord, So many souls need You, but please take time for a little, precious soul. This sweet child, Aubree, and her family need Your strength, guidance, and power. Be with this precious little girl, and give her the gift of Your infinite grace...please, if it be Your will, heal this child, and give the gift of Your love to her parents. I'm praying for baby Aubree here in Overland Park, KS. My precious grandson, Matthew was born weighing only 1 lb 1 oz...he is turning five years old this month. By the grace of God and all of those who prayed for him, he not only survived, but is absolutely perfect. Please know that your whole family will be in my prayers. I am in Austin, Texas praying for Baby Aubree. May God reach into the womb of her mother and heal all that is wrong so that Aubree can be born healthy. And if your will is different Lord, I pray that you allow this baby to survive all that will occur upon her birth, hold her in your hands and provide your strength. I also ask for protection and healing for the family, and strength to deal with anything that might come their way. Isiah 1:9. Praying in Louisburg, KS for little Aubree. Lord, we come to you today and lift up this special little soul. You know her well and you know how she is stitched together in the womb. Lord, we ask that your glory be shown through this story of a little girl who flourishes in your name despite the odds that have been stacked against her. Bless her and her family and show the doctors the wonders of your miraculous strength! You are the one in control of all things. We gratefully accept your will. In Jesus' name I pray these things. Amen. Praying for Aubree and knowing that things will work out for her family. I'm sorry it will be such a tough start for her - wishing things will have the best outcome & I will pass this along to our prayer chain at church. God Bless!